I don’t remember a point in my childhood where I believed in Santa Claus. I loved the stories surrounding Santa Claus, & I loved the giving & receiving of gifts. But just like other fairy tales I had read about, I didn’t really believe that they existed. This is similar to how we have chosen to go about the topic of Santa Claus for our children. We talk about Santa, we read books about Santa, we watch movies about Santa. But our sons have never truly believed that Santa was real. They have always helped buy gifts for others, never received a present “From: Santa”, & have always been very appreciative to the people who actually gave them gifts. Childhood is full of fairy tales & magic. 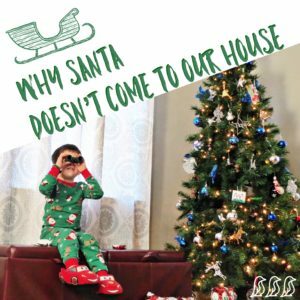 We don’t put near as much effort into convincing children that their favorite story book character is real… so why do we push so hard when it comes to Santa? My kids hate the idea of sitting on Santa’s lap! They don’t want to go near him & cry if we make an attempt. The idea of Santa coming our house in the middle of the night also worried them. Especially my older son. He was not on-board with anyone sneaking into our house. All of that being said… I do understand why families choose to go all in on Santa. We all want childhood to be a magical time where you can believe in things that don’t really exist or make sense. We equate Santa to innocence, & we do not want to rob our children of this. There are many children that adore the idea of Santa & find it fun & magical. There are also many children who will not be devastated when they come to find out that he is not real. So in those situations… I get it. But… I also firmly believe that my children do not have worse Christmasses than other children simply because we do not insist that Santa Claus is real.